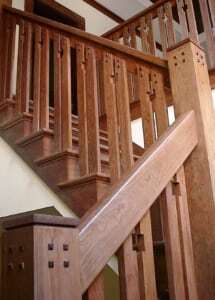 At the moment, one of our most popular style requests is craftsman staircase design. Known for handiwork, simplicity, and natural materials, the craftsman style movement continues to grow in popularity. Solid wood construction adds to the cozy, charming appeal of craftsman homes and commercial spaces. 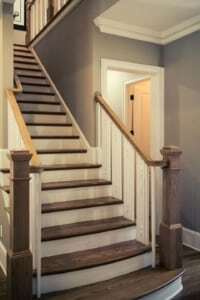 Are you seeking simple, natural craftsman stairs to complete your space? 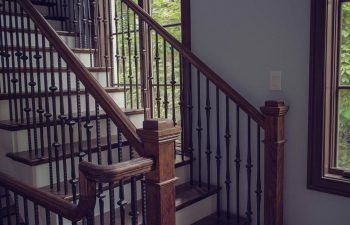 This week, we share four unique examples of craftsman staircase design. For our first featured project, simplicity is key. The consistent, rich tone stain is eye-catching while understated. The straight block newels and balusters are topped with a straight handrail, and small stud accents complete the look. Our next featured craftsman staircases showcase a popular two-toned style. 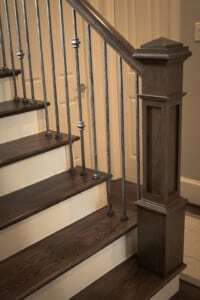 The paint grade baluster system is an excellent display of handiwork and simplicity. The stained treads, newels, and railing system offer a cozy warmth, enhancing the appeal of this beautiful craftsman home. 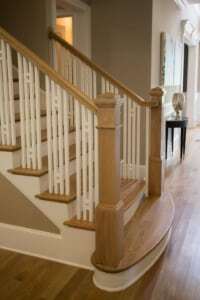 Craftsman style is often considered the most comfortable present-day design, and the custom stair below is an excellent example of the warm and inviting nature of this style. While many craftsman staircase designs feature both wood carriages and handrail systems, other elements can also be incorporated. Our next featured design incorporates wrought iron balusters for a unique and charming combination. The dark, classic craftsman box newels and handrail are perfectly finished with a hammered knuckle balustrade system. In order to ensure that every staircase is delivered on time and installed flawlessly, we employ a robust and proven project management system. We stand behind our staircase systems with a warranty to ensure continued quality and satisfaction. Visit our craftsman staircase project gallery for additional inspiration from our exquisite projects. From inspiration to installation, our team is committed to designing and building the highest quality custom staircases. Our reputation speaks for itself and client satisfaction is our highest priority. Contact us today to discuss your next custom stairs project.